Our selection below features commentary on both the Lord’s prayer as well as on some hows and whys about prayer itself from St. Augustine, one of the most preeminent theologians and Doctors of the Church. One could say St. Augustine (pictured above) was a somewhat “late bloomer” to Christianity. He was born in Targaste, in Northern Africa (what is now Algeria) in 354 A.D. While he received a Christian education, his baptism was delayed. He became enamored with a heresy known as Manichaeism. This taught of a struggle between the dualistic forces of good and evil, with good coming from God (in one’s spirit) and evil from Satan (in one’s body), as if there were a good God of spirit verses an equal opposing evil one of matter. St. Augustine was a renowned rhetorician in Carthage, Rome, and, later, in Milan during this somewhat freewheeling time in his life, in his 20’s and early 30’s. He had a mistress, as well as a child out of wedlock. When later remembering these days, he wrote in his great book Confessions that “As a youth I prayed, ‘Give me chastity and continence, but not yet.’"
The Manichees made him think for awhile that he needn't own up to his sins, as they came from the God of evil, personified by the devil. (Kind of a 4th century version of “the Devil made me do it”, as if he had no free will in these matters!) Worldly success and sensuality had a hold on his future great saint for a number of years. Meanwhile, his mother St. Monica prayed constantly to God for her son’s conversion. Her perseverance bore fruit as he finally broke down all his resistance one day while reading the following scripture passage from St. Paul: “Not in rioting and drunkenness, not in chambering and wantonness, not in strife and envying; but put ye on the Lord Jesus Christ, and make not provision for the flesh, in concupiscence” (Rom 13:12-14) . He was baptized a Catholic by St. Ambrose, Bishop of Milan in 387 A.D. and was ordained a priest in 391. Four years later he became Bishop of Hippo in North Africa, a post he held until his death in 430. 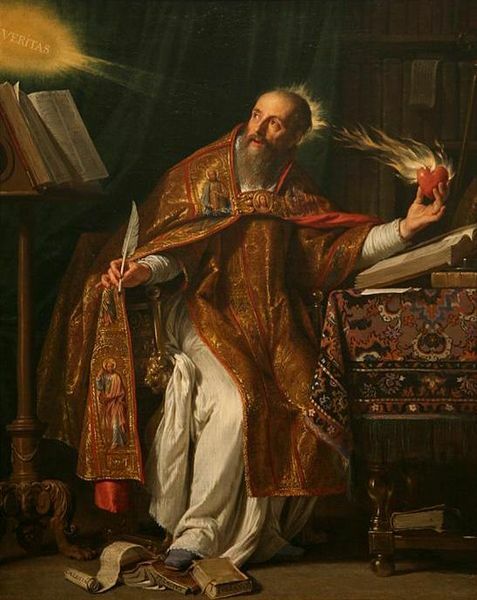 St. Augustine has blessed us with a prodigious amount of writing about our great faith. His works include various treatises, sermons, letters, and his great books: his Confessions (mentioned earlier, recounting his conversion) and his City of God, written early in the 5th century defending Christianity against those who blamed the Christians for the sacking of Rome by the Visigoths in 410. It is neither wrong nor unprofitable to spend much time in praying, if there be leisure for this without hindering other good and necessary works to which duty calls us, although even in the doing of these, as I have said, we ought by cherishing holy desire to pray without ceasing. For to spend a long time in prayer is not, as some think, the same thing as to pray “with much speaking.”Multiplied words are one thing, long-continued warmth of desire is another. For even of the Lord Himself it is written, that He continued all night in prayer, (Luke 6:12) and that His prayer was more prolonged when He was in an agony (Luke 22:43); and in this is not an example given to us by Him who is in time an Intercessor such as we need, and who is with the Father eternally the Hearer of prayer? The brethren in Egypt are reported to have very frequent prayers, but these are very brief, and, as it were, sudden and ejaculatory, lest the wakeful and aroused attention which is indispensable in prayer should by protracted exercises vanish or lose its keenness. And in this they themselves show plainly enough, that just as this attention is not to be allowed to become exhausted if it cannot continue long, so it is not to be suddenly suspended if it is sustained. Far be it from us either to use “much speaking” in prayer, or to refrain from prolonged prayer, if fervent attention of the soul continue. To use much speaking in prayer is to employ a superfluity of words in asking a necessary thing; but to prolong prayer is to have the heart throbbing with continued pious emotion towards Him to whom we pray. For in most cases prayer consists more in groaning than in speaking, in tears rather than in words. But He setteth our tears in His sight, and our groaning is not hidden from Him who made all things by the word, and does not need human words…..
For whatever other words we may say, whether the desire of the person praying goes before the words, and employs them in order to give definite form to its requests, or comes after them, and concentrates attention upon them, that it may increase in fervor, if we pray rightly, and as becomes our wants, we say nothing but what is already contained in the Lord’s Prayer. And whoever says in prayer anything which cannot find its place in that gospel prayer, is praying in a way which, if it be not unlawful, is at least not spiritual; and I know not how carnal prayers can be lawful, since it becomes those who are born again by the Spirit to pray in no other way than spiritually. For example, when one prays: “Be Thou glorified among all nations as Thou art glorified among us, “and Let Thy prophets be found faithful,” (Sirach 36: 4, 21) what else does he ask than, “Hallowed be Thy name”? When one says: “Turn us again, O Lord God of hosts, cause Thy face to shine, and we shall be saved,” (Ps. 80:8, 20) what else is he saying than, “Let Thy kingdom come”? When one says: “Order my steps in Thy word, and let not any iniquity have dominion over me,” (Ps. 119:133) what else is he saying than, “Thy will be done on earth as it is in heaven”? When one says: “Give me neither poverty nor riches,” (Prov. 30:8.) what else is this than, “Give us this day our daily bread”? When one says: “Lord, remember David, and all his compassion,” (Ps. 132:1) or, “O Lord, if I have done this, if there be iniquity in my hands, if I have rewarded evil to them that did evil to me,”(Ps. 7:4-5) what else is this than, “Forgive us our debts as we forgive our debtors”? When one says: “Take away from me the lusts of the appetite, and let not sensual desire take hold on me,” (Sirach 23:6) what else is this than, “Lead us not into temptation”? When one says: “Deliver me from mine enemies, O my God; defend me from them that rise up against me,” (Ps. 59:2) what else is this than, Deliver us from evil”? These things it is our duty to ask without hesitation for ourselves and for our friends, and for strangers, yea, even for enemies; although in the heart of the person praying, desire for one and for another may arise, differing in nature or in strength according to the more immediate or more remote relationship. But he who says in prayer such words as, “O Lord, multiply my riches;” or, “Give me as much wealth as Thou hast given to this or that man;” or, “Increase my honors, make me eminent for power and fame in this world,” or something else of this sort, and who asks merely from a desire for these things, and not in order through them to benefit men agreeably to God’s will, I do not think that he will find any part of the Lord’s Prayer in connection with which he could fit in these requests. Perhaps you may still ask why the apostle said, “We know not what to pray for as we ought,” (Rom. 8:26) for it is wholly incredible that either he or those to whom he wrote were ignorant of the Lord’s Prayer. He could not say this either rashly or falsely; what, then, do we suppose to be his reason for the statement? Is it not that vexations and troubles in this world are for the most part profitable either to heal the swelling of pride, or to prove and exercise patience, for which, after such probation and discipline, a greater reward is reserved, or to punish and eradicate some sins; but we, not knowing what beneficial purpose these may serve, desire to be freed from all tribulation? To this ignorance the apostle showed that even he himself was not a stranger (unless, perhaps, he did it notwithstanding his knowing what to pray for as he ought), when, lest he should be exalted above measure by the greatness of the revelations, there was given unto him a thorn in the flesh, a messenger of Satan to buffet him; for which thing, not knowing surely what he ought to pray for, he besought the Lord thrice that it might depart from him. At length he received the answer of God, declaring why that which so great a man prayed for was denied, and why it was expedient that it should not be done: “My grace is sufficient for thee; my strength is made perfect in weakness” (2 Cor.12:7-9). Accordingly, we know not what to pray for as we ought in regard to tribulations, which may do us good or harm; and yet, because they are hard and painful, and against the natural feelings of our weak nature, we pray, with a desire which is common to mankind, that they may be removed from us. But we ought to exercise such submission to the will of the Lord our God, that if He does not remove those vexations, we do not suppose ourselves to be neglected by Him, but rather, in patient endurance of evil, hope to be made partakers of greater good, for so His strength is perfected in our weakness. God has sometimes in anger granted the request of impatient petitioners, as in mercy He denied it to the apostle. For we read what the Israelites asked, and in what manner they asked and obtained their request; but while their desire was granted, their impatience was severely corrected (Numb. Ch. 11). Again, He gave them, in answer to their request, a king according to their heart, as it is written, not according to His own heart (1 Sam. 8:6-7). He granted also what the devil asked, namely, that His servant, who was to be proved, might be tempted (Job 1:12; 2:6). He granted also the request of unclean spirits, when they besought Him that their legion might be sent into the great herd of swine (Luke 8:32). These things are written to prevent anyone from thinking too highly of himself if he has received an answer when he was urgently asking anything which it would be more advantageous for him not to receive, or to prevent him from being cast down and despairing of the divine compassion towards himself if he be not heard, when, perchance, he is asking something by the obtaining of which he might be more grievously afflicted, or might be by the corrupting influences of prosperity wholly destroyed. In regard to such things, therefore, we know not what to pray for as we ought. Accordingly, if anything is ordered in a way contrary to our prayer, we ought, patiently bearing the disappointment, and in everything giving thanks to God, to entertain no doubt whatever that it was right that the will of God and not our will should be done. For of this the Mediator has given us an example, inasmuch as, after He had said, “Father, if it be possible, let this cup pass from me,” transforming the human will which was in Him through His incarnation, He immediately added, “Nevertheless, O Father, not as I will but as Thou wilt” (Matt. 26:39). Wherefore, not without reason are many made righteous by the obedience of One (Rom. 5:19). But whoever desires from the Lord that “one thing,” and seeks after it, (Ps. 27:4) asks in certainty and in confidence, and has no fear lest when obtained it be injurious to him, seeing that, without it, anything else which he may have obtained by asking in a right way is of no advantage to him. The thing referred to is the one true and only happy life, in which, immortal and incorruptible in body and spirit, we may contemplate the joy of the Lord forever. All other things are desired, and are without impropriety prayed for, with a view to this one thing.For whosoever has it shall have all that he wishes, and cannot possibly wish to have anything along with it which would be unbecoming. For in it is the fountain of life, which we must now thirst for in prayer so long as we live in hope, not yet seeing that which we hope for, trusting under the shadow of His wings before whom are all our desires, that we may be abundantly satisfied with the fatness of His house, and made to drink of the river of His pleasures; because with Him is the fountain of life, and in His light we shall see light, (when our desire shall be satisfied with good things, and when there shall be nothing beyond to be sought after with groaning, but all things shall be possessed by us with rejoicing.